Phosphoenolpyruvate (2-phosphoenolpyruvate, PEP) is the ester derived from the enol of pyruvate and phosphate. It exists as an anion. PEP is an important intermediate in biochemistry. It has the highest-energy phosphate bond found (−61.9 kJ/mol) in organisms, and is involved in glycolysis and gluconeogenesis. In plants, it is also involved in the biosynthesis of various aromatic compounds, and in carbon fixation; in bacteria, it is also used as the source of energy for the phosphotransferase system. PEP is formed by the action of the enzyme enolase on 2-phosphoglyceric acid. Metabolism of PEP to pyruvic acid by pyruvate kinase (PK) generates adenosine triphosphate (ATP) via substrate-level phosphorylation. ATP is one of the major currencies of chemical energy within cells. Compound C00631 at KEGG Pathway Database. 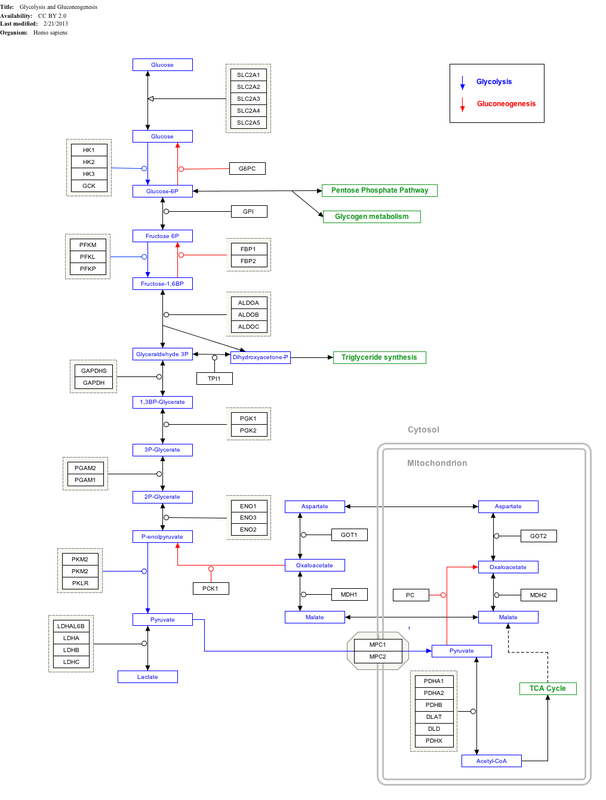 Enzyme 4.2.1.11 at KEGG Pathway Database. Compound C00074 at KEGG Pathway Database. Enzyme 2.7.1.40 at KEGG Pathway Database. Compound C00022 at KEGG Pathway Database. PEP may be used for the synthesis of chorismate through the shikimate pathway. Chorismate may then be metabolized into the aromatic amino acids (phenylalanine, tryptophan and tyrosine) and other aromatic compounds. The first step is when Phosphoenolpyruvate and erythrose-4-phosphate react to form 3-deoxy-D-arabinoheptulosonate-7-phosphate (DAHP), in a reaction catalyzed by the enzyme DAHP synthase. ^ "InterPro: IPR008209 Phosphoenolpyruvate carboxykinase, GTP-utilising". Retrieved 2007-08-17. ^ "BioCarta - Charting Pathways of Life". Retrieved 2007-08-17.